Hello again everyone, today i am super excited to share my Zodiac Elemental cards i have made using Imagine Design Create's large A5 Zodiac stamp set. 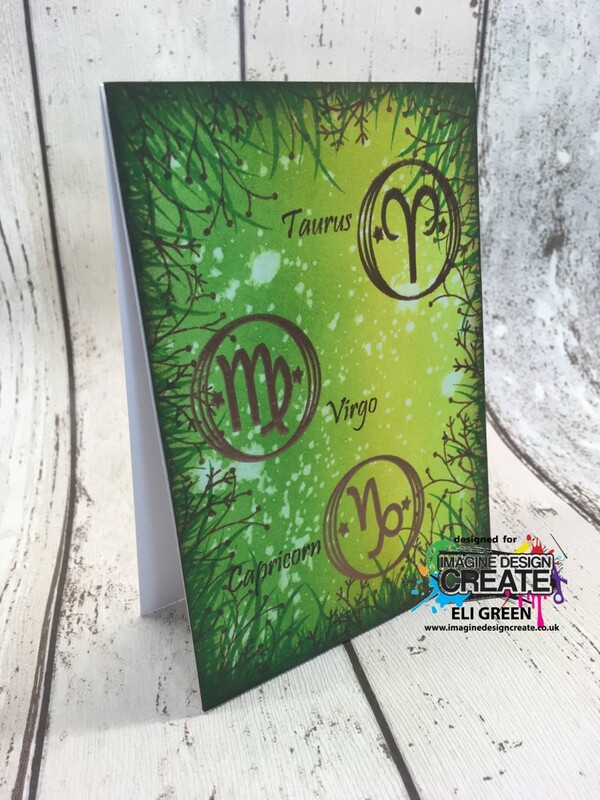 This set comes with all 12 star signs in both picture and script form, the bonus is that Imagine Design Create also has this stamp set in A6 size too! 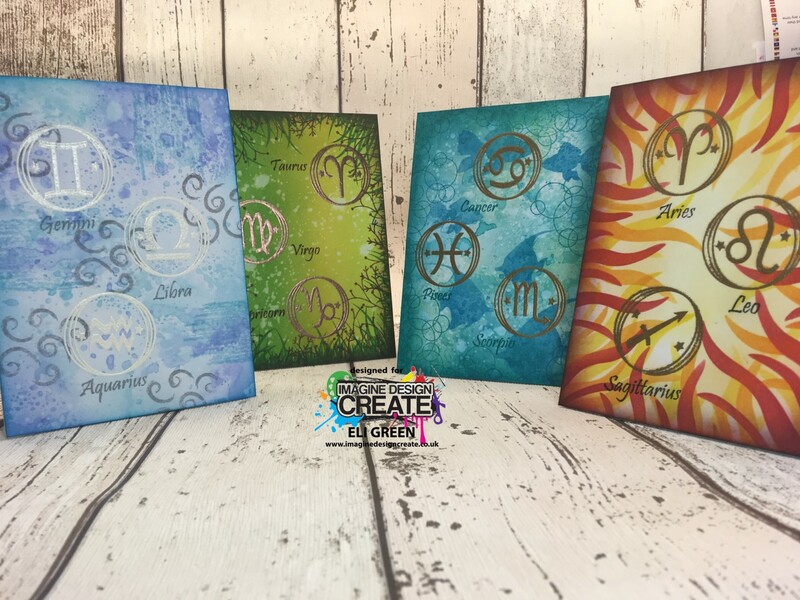 As you can see from this blog i couldn't wait to use all the stamps in this set, and after going through my stash of Imagine Design create goodies i decided to try and create Elemental themed cards. As i have four cards to share with you today I'll try to keep this blog short(ish) by listing the products used underneath each picture. 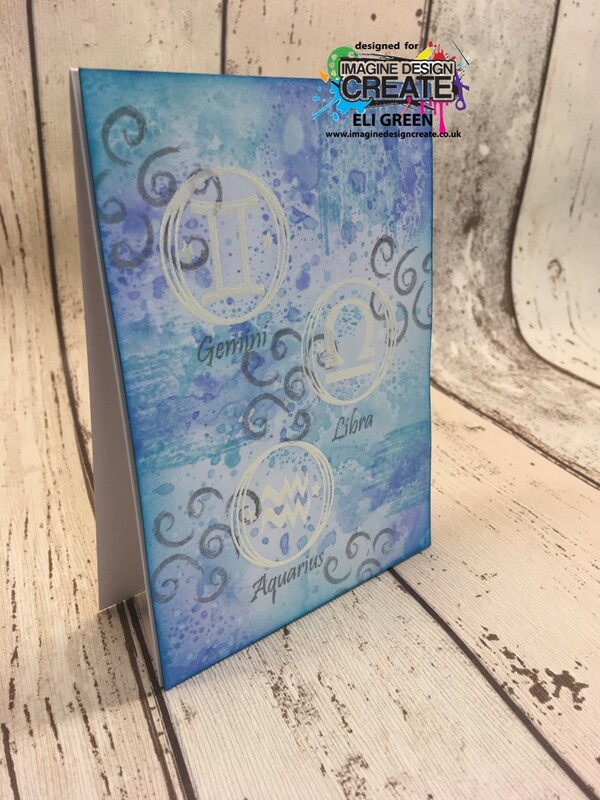 Water Elements - A5 Zodiac stamp set, Mini Shape Layers stamp set and Fishes stencil all by Imagine Design Create. Distress inks Tumbled Glass, Cracked Pistachio, Peacock Feathers and Broken china. Gold Embossing powder. Earth Element - A5 Zodiac, Mini Grasses and Doodle Flowers stamp set all by Imagine Design Create (the doodle flower stamp set is no longer available but Imagine Design Create have recently released Floral Sketches stamp set that would look lovely.) Distress ink in Mowed lawn, Twisted Citron and Vintage Photo. Gold embossing powder. 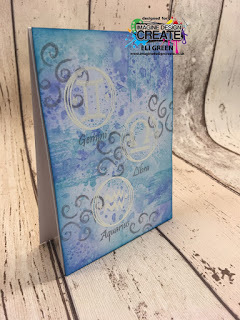 Water Element - A5 Zodiac and Sketchy Textures stamp sets by Imagine Design Create. Distress inks in Tumbled Glass, Broken China and Shaded Lilac. Archival ink in Shadow Grey. White embossing powder.